John McDonagh in Cabtivist. Photo by Cait Mullen. 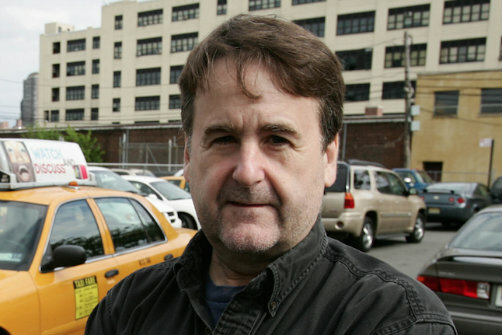 BOTTOM LINE: Drawing from over 35 years as a New York City cab driver, John McDonagh tells his stories of fame, nostalgia, and the fight for freedom. John McDonagh is an old-school cab driver, a loud and vibrant Irishman with a 35-year history behind the wheel, and significant insight about the city’s transformation over the years. In Cabtivist, he weaves tales of his time as a yellow cab driver with the kind of sharp, smart-mouthed New York flair normally found only in movies (think Dustin Hoffman in Midnight Cowboy, or Jerry Seinfeld back in the good old days). Those who remember what New York used to be will delight in following McDonagh’s tales. Cabtivist opens with McDonagh listing the many ways in which a NYC yellow cab driver has it worse than the unionized Central Park carriage horses. Species-ism aside, McDonagh clearly makes his point that the life of a cab driver is a long and difficult one, filled with long hours and strange circumstances. Like most New Yorkers who’ve been in a cab with a talkative driver, I expected stories about crazy passengers and traffic debacles. But the narrative centers instead on the exceptional opportunities that McDonagh has had, largely as a result of his blog and outspoken activism. In the first half of the show, he describes some of his brushes with fame. On his impressive list of celebrity moments include reality TV, adventures with Top Gear's Richard Hammond, and the time he guided British TV host Stephen Fry through the storied Italian parts of Queens during Fry’s filming of America. But McDonagh’s most exciting piece is actually a story of a near miss. To raucous laughter, he recounts the twisting and complex tale of the time he and fellow driver Seth came this close to becoming contestants on CBS’ The Amazing Race. In these stories McDonagh becomes everyone’s favorite bar regular, telling his larger-than-life tales with his signature panache. His natural stage presence and seamless storytelling make McDonagh a delight to watch. In fact, McDonagh reveals that the loss of his shot at The Amazing Race was a direct result of his activism, and the second half of the show is dedicated to his participation in the Irish Republican movement as well as anti-war protest and street theatre. From billboards in the ‘80s to cheeky flyering during the beginning of the Iraq war, his stories reveal a deeply committed thinker while also bringing levity to the very real struggles of the working class in the modern age. The overarching feel of Cabtivist is one of nostalgia. McDonagh closes with a poem he performed at a major literature festival where he wonders “what happened to my city?” The answer, it seems, is everything, and the changes of gentrification and globalization are sometimes too much to bear. Even in remembering a time when the East Village was the notoriously dangerous Alphabet Jungle, the wistfulness and weight of the past is clear. In Cabtivist, John McDonagh is a history of one, a last scion of a bygone age, and he looks back with fondness, frankness, and an infectious charm. Cabtivist is a love song to the city that never sleeps, and who better to tell that story than a cab driver? Cabtivist is written and performed by John McDonagh. Directed by Kira Simring. Additional Music by Rory Kirwan. Dramaturg is Cait Mullen.